Ideal for any on-call professional, resident, or medical student, this best-selling reference covers the common problems you’ll encounter while on call in the hospital. 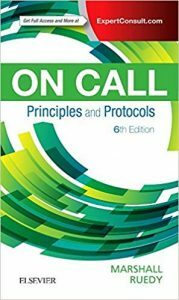 On Call Principles and Protocols, 6th Edition, by Drs. Shane A. Marshall and John Ruedy, fits perfectly in your pocket, ready to provide key information in time-sensitive, challenging situations. You’ll gain speed, skill, and knowledge with every call – from diagnosing a difficult or life-threatening situation to prescribing the right medication. Delivers consistent, easy-to-follow coverage of the most common on-call problems and approaches, including what to do from the initial phone call, “Elevator Thoughts,” how to immediately identify major threats to life, what to do at the bedside, and how to avoid common mistakes for every call. NEW! Expert Consult™ eBook version included with purchase. This enhanced eBook experience allows you to search all of the text, figures, videos, and references from the book on a variety of devices.